Principle Designer, Tamu Green, earned a Bachelors of Science in Interior Design before becoming a designer at a top Atlanta hospitality firm. After spending several years working on some of the most recognizable staples of Atlanta nightlife, she moved back to her hometown of Brooklyn. It was here that she earned a position at a high-end residential firm and fell in love with the refined details and personal touches of residential design. In 2013 Tamu started Lux Pad Interiors to bring the luxury of authentically personalized interiors to busy professionals. Lux Pad Interiors is a full service interior design firm that specializes in creating beautiful interiors which reinforce and enhance the lifestyles of our clients. Each project we encounter has its own values, desires, and challenges. At Lux Pad Interiors, we identify and assess these defining characteristics before developing design solutions to address them. This transformative process provides every client with a beautiful, functional, and authentically personalized space. Call today to schedule a consultation. We are a high-end, full-service interior design firm that offers a stylish and easy approach to living well. You can find our work in Architectural Digest, Elle Decor, The New York Times and more. Having left a successful consulting career in the 1990’s to pursue her passion for interior design, Tamara Magel worked for a number of prestigious design companies before creating Tamara Magel Lifestyle. She is now parlaying her design expertise into home fashion and fashion with a belief that interior design, like fashion, can change with the seasons, Ms. Magel utilizes neutral furniture pieces and alters home accessories throughout the year. Having already created a number of custom furniture lines, the natural next step was to delve into home and fashion accessories. Inspired by runway couture, her vision was to bring fashion into furniture and vice versa. She has a love for using exceptional textiles and materials from around the world – such as organically dyed yarns, knits, macrame and beads – to bleached woods and natural stone. The interplay of inspired textures, colors, natural materials and clean lines define her distinctive, comfortable style. Tamara’s work is infused by an inspired world-view of “weaving cultures” – reinterpreting heritages and local traditions into an exotic tapestry of design. Her lifestyle brand is one that is “at home in the world” and reflects a stylish and easy approach to living well. She has been featured in Architectural Digest, Elle Decor, The New York Times and Lonny magazines, among others. 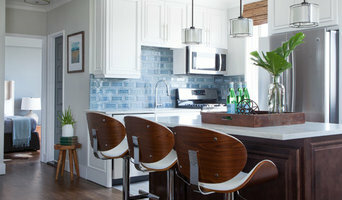 Tamara started her own interior design business eleven years ago in Washington, DC. In 2011, she opened a showroom in New York’s Soho, to showcase her furniture, paint and bedding collections and will now be Launching in the Hamptons. Tamara has the utmost respect for the environment and tries to utilize the cleanest approach for materials when launching her products. One of Tamara’s long term goals is to assist in enabling women in developing countries to create better lives for themselves and their communities. We engage our clients in a creative collaboration resulting in uniquely expressive interiors reflecting the individuality of the inhabitants. With a deep commitment to the highest level of customer service, we strive toward an end result that exceeds our client’s expectations. Lawrence Allan Inc. is a full-service, boutique design firm specializing in custom renovations, interior architecture and interior design/decoration. As an experienced faculty member of New York School of Interior Design, the nation’s top-ranked Interior Design program, Lawrence has an extensive educational background in the decorative arts, fine arts, architectural precedent and history, along with a passion for excellence, we bring an innovative approach to a broad vocabulary of design ranging from classic to modern. As project managers we act exclusively as our client’s advocates on every aspect of the project. We bring together and oversee the finest team of craftsman and specialists to ensure the work is executed expeditiously and to the highest standards. We nurture and maintain long term and ongoing relationships with all of our clients so that we may continue to serve them long after the work is completed. Whether involved in a full scale renovation, creating a furniture layout or a finish palette, acknowledging the architecture of a space is the first step. For more than 20 years, Abigail Shachat of AJS Designs has worked to blend her clients’ individual needs with the best qualities of their sites. It is an approach that transcends the idea of a particular style, creating spaces that appear more destined than arranged. Since establishing AJS Designs in 1992, she has assembled a talented group of architects and designers who are focused on offering exceptional service to their clients. AJS Design/s provides expertise in all phases of design, decoration and the construction process. Ms. Shachat holds a Bachelor of Science in Design and Environmental Analysis with honors, from Cornell University and a Master of Fine Arts in Design from The Cranbrook Academy of Art. Her education and experience provide a distinctive basis for analyzing and generating design solutions. An interest in contemporary art and architecture, as well as a strong sense of craft, inform and inspire the spaces and objects that she creates. BHD is a full service interior design studio handling both residential and commercial projects. Our focus is client satisfaction achieved by understanding and listening to client needs and executing them in an organized and timely fashion. Brett Helsham is an interior designer based in New York City. Following a childhood spent traveling and living around the world with her family, Helsham graduated with a BFA from New York University and an MFA in Interior Design from the historic New York School of Interior Design. "I was very influenced by watching my mother design our homes when I was younger," says Helsham. "Growing up in five countries, I was given the opportunity to witness interior design from the ground-up over and over again. I fell in love with every step of the process." Following her graduation, Helsham worked as an Associate Designer at Wettling Architects until 2013, when she signed on as Senior Designer for formidable firm Mr Call Designs. In 2015, she left to found her namesake studio, now working in residential, hospitality and commercial design internationally. Featured in Extreme Home Makeover for bathroom and furniture makeover. DDG DESIGN STUDIO, a unique interior/furniture design studio established in 2000 is a small design firm. The creative energy of this firm is powerful and the finished products are compelling and exciting. Simplicity, luxury, elegance, and harmony define the aesthetic: the scope ranges from modern to eclectic. Environmental awareness combines with precision, quality and exquisite detail to create the desired effect. Interior design projects include residential and commercial. The furniture design division evolved from successful designs for specific interiors. Unbridled play with form and balance has produced elegant, pure contemporary design in which line is allowed to extend beyond function. Reinterpretation of classic style with an uncanny novel twist adds to the exclusive and unique signature of this firm. The furniture designs are seductive and inviting in their subtle familiarity. They have a universal appeal for indoor and outdoor use. The design intent is to sustain the passage of time. Manhattan's Innovative Interior Design Firm | Best of Houzz 2018! House of Style&Design is an award winning interior design firm, specializing in full service interior design, turn key interiors and custom window treatments. Yelena Gerts, owner and a principal designer, known for her glamorous and elegant spaces. Yelena offers personalized service and a cutting edge style. With a great eye for color and unique details, she works closely with her clients to help them create the homes of their dreams. 2017 Vision competition named Yelena Gerts, Interior Designer of the Year. 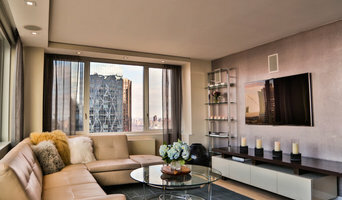 London Bridges is an interior design firm based in New York City. Our services range from providing a simple face lift for your interior space to a complete gut renovation . London Bridges' design philosophy begins with an honest collaboration between designer and client. The partners begin with a concept which is then seamlessly translated into a space that is simple yet elegant, functional yet intricate in its detail. "Our objective is to create practical living spaces which radiate serenity, providing an oasis from the outside world." What is the Hygge Design Ideas approach? By its very definition, Hygge literally translates into “the feeling of being home”—and can be attained simply by doing those things that make you feel happy and comfortable. Hygge is all about kicking back in a warm and cozy setting; finding joy in simplicity. With our unintimidating approach, we create spaces that will ease the stress of your every day; a place where you want to curl up in. Whether you’re moving to a new place or just want a fresh look, we want to bring Hygge into your home. We provide a custom and personalized service that is easy and affordable. We’ll guide you through the entire interior design process, from inspiration to furniture. mercer INTERIOR is a full service design firm specializing in creating environments tailored to your unique needs. Carefully listening to our clients, we can realize a vision and work from concept to completion developing solutions that are truly inspired. Based in New York City and the Hudson Valley, mercer INTERIOR specializes in both high-end residential and small commercial projects. Working closely with experienced tradespeople and contractors assures every detail is handled with care. We know these details are important parts of a client’s story, and the finished result will represent their individual viewpoint. Whether reimagining a home office, configuring your dream kitchen or opening a boutique hotel, you will receive personal attention, high-level service and your desired outcome. Peter Pawlak has been practicing architectural design for over 17 years. Graduating from Cooper Union School of Architecture in 1990 he worked for Gwathmey Siegel Architects for 14 years. During his tenure there he built an extensive portfolio of residential projects throughout the United States. In 2005 he established his own design practice. This practice has produced numerous projects in residential and commercial areas. Each design is a result of a collaborative process that involves the client and various artists, craftsmen and professionals whose expertise and contributions create environments conducive to unique and creative spatial solutions. *Architecture, Interior Design, Furniture Design* Good home design is formed in co-operation between owner and designer. Studio WaMM is an award-winning architecture and interior design company specializing in contemporary residential and commercial design. Studio WaMM's goal when designing is to create spaces that not only satisfy client's aspirations but to deliver a singular, unique and personalized space, that will allow their users to fully express who they are and to improve their day to day life. Collaboration and re-imagination define the firm main principals. Since it's conception Studio WaMM has conceived and executed residential, retail and commercial projects in the Northeastern United States as well as Latin-America. Studio WaMM Architecture is led by New York state registered architect Meg Chapman. Studio WaMM Interior Design is led by New York State Certified Interior Designer Welkhenia Daley. Our interiors team have completed multiple commercial and high-end residential projects, including private villas, hotels, restaurants, and others. Our services are often offered in combination with our architecture department as well as solo interior designer and or interior design consultant. Our interior design team can offer a wide array of services, ranging from planning, furniture and finishes selection and product design.